Having a will is necessary, but there is a great deal of information the legal document does not include. 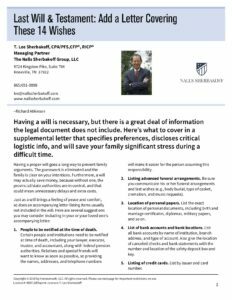 Here’s what to cover in a supplemental letter that specifies preferences, discloses critical logistic info, and will save your family significant stress during a difficult time. Click the thumbnail below to read and download the full article. 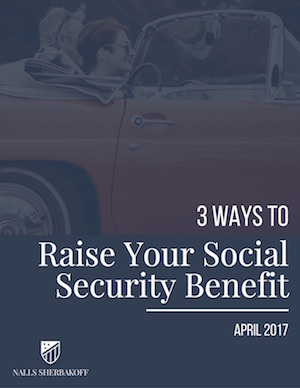 Click the image above to download our latest white paper! Sign up to receive the latest posts, news, and more from the Nalls Sherbakoff Group. In his role as Financial Advisor, Lee Sherbakoff specializes in creating and executing financial plans that lead to sustainable long-term, real life returns in order to meet his clients’ deepest and most important financial goals and objectives. Lee is committed to his clients and offers independent, non-conflicted financial advice, strong ethical practices, and a profound duty to service.